Can you take Spring certification without Pivotal Training Course? Yes, you can take Spring certification without taking mandatory Spring training. Pivotal, the company behind Spring, has announced on 10th May 2017 that "Spring Certification Exams are now available for individual purchase, without enrolling in the course". This is one of the most exciting changes in the Spring certification program since it's launched 10 years back. The cost of Spring certification was the single, biggest obstacle for many experienced Java and Spring developers to get certified for their Spring framework skills. This step from Pivotal is a really positive step and gives a real chance to many experienced developers in cost-sensitive countries like India to get certified for their skill. Now, you don't have to enroll for a 50K training if you have good knowledge of Spring certification and exam objectives, just like Java certification, you can buy the Spring certification voucher @ 200 USD and take the exam online or offline at any test center. Ever since Spring certification was announced, the training was part of the Spring certification itself. It wasn't possible to take the Spring certifications exams e.g. Core Spring or Spring Web without taking the associated training with them. Even though the training was worth of money and still the best resource for preparing Spring certification, it is very expensive. The cost of Spring certification in India was more than 50K INR because of the training itself. Same was true for other countries as Spring training cost around 3000 USD on the USA, North America, and other European countries on their respective currencies e.g. 2700 EURO in Germany and other European Union nation and 2300 GBP in the UK. I have talked to many Spring developers including my colleagues, friends, and readers of my blog and the single biggest reason for not going for Spring certification was the associated training cost. I can understand that because 50K INR is a lot of money to pay from your pocket if you don't have any corporate sponsorship or your company is not paying for certification. Same is true for Spring developers in the USA and North America, 3000 USD is not a small sum of money for even programmers looking to get certified in the USA. If you are an experienced Spring programmer and want to take advantage of this excellent opportunity to become a certified Spring developer then you take David Mayer's Online Spring Mock test to first check out how ready you are for Spring certification exam. If you can score 80% on this exam then you can straight away go and buy Spring certification voucher and schedule the exam at the earliest opportunity, but if you score 50% or less then you may need to prepare for a couple of months before you go for Spring certification. Spring is one of the most popular frameworks for developing Java application. It's Dependency injection feature promoted best practices and made unit testing easier. IT Industry, especially the Java world, recognize Spring as an important skill for web development. Pivotal provides three main Spring certification exams, Spring Professional Certification Exam, Spring Web Application Developer Certification Exam, and Spring Integration Specialist Certification exam. 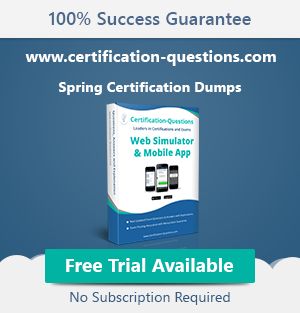 This is the most popular Spring certification exam which based upon Core Spring course of Pivotal. If you have been using Spring framework in your Java application and familiar with key concepts e.g. Spring container, dependency injection, Spring template support then you can give this exam. You can read Spring in Action to prepare for this exam, it covers most of the exam topics. This is the second most popular Spring certification exam which tests your experience and knowledge about Spring MVC framework e.g. developing web applications and RESTful web services using Spring MVC framework. Enterprise Integration Specialist Certification Exam. This exam is based upon Enterprise Spring course and covers inter-process communications using Web Services (REST) and Messaging (JMS, AMQP) and then builds on this foundation to cover Spring Integration, Spring Batch, and Spring Cloud Data Flow. You can either take the Enterprise Spring training to prepare for this exam. The course is based upon popular book Enterprise Integration Patterns, which you can also read if you are not taking training. Pivotal, the company behind Spring framework, also provide relevant training to prepare you for those exams. The cost of Spring certification in India including training is more than 3000 USD in America and 50,000 INR in India, which may be expensive for many, but, if you can afford or if your company is provided full or partial subsidy then its is the best way to prepare for the exam. Even though Spring certification is there from last 10 years, because of its high cost and mandatory training there is a not a lot of free resources available on the Internet, especially if you compare Spring certification to Oracle Java certification e.g. unlike OCAJP and OCPJP, there is no Spring certification exam guide which covers all the topic for Spring Core Certification or Spring Web Application developer exam, so you need to prepare from various Spring books. Here are some of the good books to prepare for Spring certifications e.g. Professional Spring Developer Exam, Spring Web Application Developer Exam, and Spring Enterprise Integration Specialist Exam. Here are some of the free mock exams and pdf dumps to prepare for Spring certifications e.g. Professional Spring Developer Exam, Spring Web Application Developer Exam, and Spring Enterprise Integration Specialist Exam. You can get an idea about what kind of questions are asked and level of knowledge you will need to do well in the exam. That's all about whether you can Spring certification without course or not. Now that, Pivotal has announced that Spring certification will be available without mandatory training, it opens a door for thousands of Spring developers across the world, who wanted to become a certified Spring developer but couldn't afford the training cost, especially in country like India, where cost of Spring certification was the single most important reason of not getting certified. Now that obstacle is out-of-the-way, I expect more and more experienced Spring developer will go for various Spring certifications e.g. Core Spring, Spring Web, or Spring Boot, which will eventually improve their knowledge. IT Industry will also benefit from the improved quality of Spring developers. All the best for your Spring certification exam. Could you please share format of these exams. Whether everything is mcq or you have to implement caseStudy programs also ? Hello Saurabh, Yes, all questions are multiple choice questions, you will get 90 minutes to answer 50 MCQ questions and you must answer 38 questions correctly (76%) to pass the exam. The passing percentage is certainly on higher side. Hello Javin, It looks there has been some change in Spring Certificaiton, Person VEU is no longer conducting Pivotal exams including Sprinc PRofessional Certification and Spring Web Applicaiton Developer Certification. Instead examlocal is conducting exam which will be online only, which means you don't need to go to the exam center for taking exam. Though you need to show your ID proof and and need a web camera so that Spring guys can monitor you while doing exam.